KENNEDY SPACE CENTER, FL – Clear skies and a nearly full Moon offer the distinct possibility to witness an astronomical launch spectacular for all those who have traveled near and far to witness the nighttime liftoff of an Orbital ATK Cygnus commercial cargo mission for NASA to the space station on Tuesday night, March 22. With the heaviest Cygnus ever bolted atop and packed to the gills with science and supplies for the six person crew living and working aboard the International Space Station (ISS), a venerable United Launch Alliance Atlas V rocket is due to blastoff on March 22, at 11:05 p.m. EDT from Cape Canaveral Air Force Station in Florida. The nighttime liftoff is targeted for 11:05 PM EDT March 22, at the opening of a 30 minute launch window from Space Launch Complex 41 at Cape Canaveral Air Force Station in Florida. 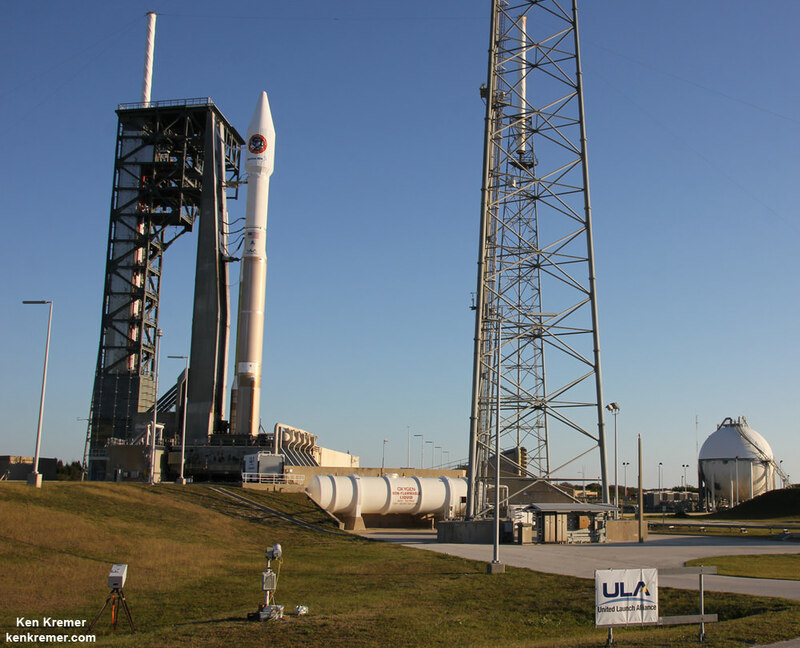 The ULA Atlas V rocket will liftoff on the CRS-6 resupply mission with the private Orbital ATK Cygnus spacecraft under a commercial resupply services (CRS) contract to NASA. The Atlas V/Cygnus CRS-6 launch coverage will be broadcast on NASA TV and the NASA launch blog beginning at 10 PM, Tuesday night. NASA will also provide additional live coverage overnight of the critical solar array deployment at 12:45 a.m. March 23 followed be a post-launch briefing will be approximately two hours after launch. The weather forecast has been upgraded and currently calls for an unusually favorable 90 percent chance of acceptable conditions at launch time. In case of a delay for any reason due to weather or technical issues the back up launch opportunity is slight earlier at 10:40 p.m. Wednesday, March 23. NASA TV coverage would start at 9:45 p.m.
– Gecko Gripper, testing a mechanism similar to the tiny hairs on geckos’ feet that lets them stick to surfaces using an adhesive that doesn’t wear off. This exceeds the stated maximum payload of 3500 kg by a whopping 65%.